There are a variety of toys and games available which can provide entertainment while helping to ground your children, or the whole family, in the Bible and in Christian living. 18 months and up. The set includes a giraffe scoop that is stored in the top of the ark, a swimming fish in the water-filled center, water-squirting seal, bubble-blowing hippo and a spinning water wheel. Set has 3 suction cups that fasten the ark to tub or a tiled wall. For ages 18 months and up. Made of plastic. Grades Pre K - K. Learn about God's love through scripture and Bible story craft projects. Each craft project begins with a scripture reference and a short summary to help guide the parent/teacher. Read the entire Biblical passage, discuss its meaning with the children, and then follow up with a craft activity. Reproducible patterns. 64 pages. 7 years and up. Budding authors simply write and illustrate their story using the markers and special book pages included in the kit. This special bible-themed version is based on the best-seller Illustory. Includes story planner, Bible references, and Christian topics. Choice of 6 cover colors. Includes book and cover pages, markers, and postage-paid envelopes. Turn your computer into a lively dance arcade for hours of family fun with music worth listening to, with 35 Christian songs from well-known artist. Featuring: ZOEgirl, tobyMac,Steven Curtis Chapman and more. CD-ROM. Age 8 and up. You'll take your child on an exciting adventure as they work to solve a mystery. They'll overcome dangers and stop a crime from being committed by guiding Whit, Connie and Eugene through as they investigate clues and discover important facts. Stop a selfish art dealer from stealing a priceless artifact, while encouraging family values & rewarding Christian virtues like faith, trust and more. Featuring the voice talent of the popular Adventures in Odyssey radio series. Age 8 and up. Unravel the mysterious accusations against Eugene Meltsner's parents as you play the role of Whit, Connie, and Eugene. Investigate clues and discover important facts, eventually leading you to the South American jungle to solve the mystery. It also teaches and encourages family values by rewarding Christian virtues like faith, trust, and more. Featuring the voice talent of Will Ryan, Katie Leigh, and Paul Herlinger and writing of Marshal Younger--the same voice actors and writers from the popular Adventures in Odyssey radios series. This inspiring puzzle of the miracles performed by Jesus was created by well known artist and gospel singer Lynn Morgan. The central panel shows the miracle of Jesus turning water into wine. Each of the seventeen miracles portrayed is identified by name and by chapter and verse where it appears in the Bible. Let heaven's light shine in with these Christian sun catchers! Approx. 3" x 4". 2 each of 6 designs. Christian beads in assorted colors. Approximately 5x6 mm each. 800 count bag. A variety of Christian symbols in metallic color. Package of 200. 100 piece Veggie Tales jigsaw puzzle. Helps to develop problem solving and concentration skills. Age 10 and up. 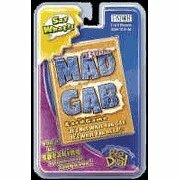 Play Bible Mad Gab Card Game and you'll start speaking in a silly new way! See if you can solve ridiculous riddles like: "Cohen Peas." Can you hear what you really said? Say it over and over until you hear yourself say, "Go In Peace."